What a sight it must have been for 24-year-old Captain Tod Carter as he stood near Winstead Hill facing north toward his boyhood home, just over a mile away. It was late November of 1864 and Young Tod had not seen his home since that bitter war began. 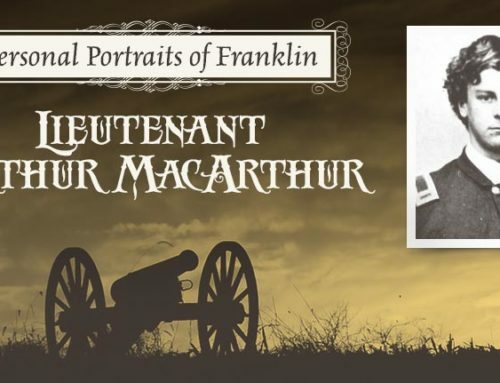 Having enlisted in the 20th Tennessee infantry to defend his native state, he fought and campaigned in most of the major engagements in the western theatre. His eyes now took in a sight much different from the home he had left over three years before. The Union Army had taken control of the town of Franklin hours before Carter and his confederate comrades had arrived. They had set up miles of defensive works or trenches, literally yards south of his homestead. Federal cannons glistened in the sun near the Carter family smokehouse and farm office. No doubt he thought of his family and wondered with anxiety of their fate as federal soldiers swarmed through his home that had been commandeered for use as Union headquarters. 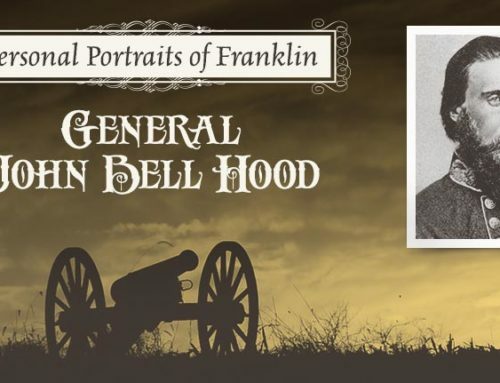 On November 30th 1864, two armies totaling some 40,000 men, faced off across the cotton fields and pasture-land that surrounded the town of Franklin. The battle of Franklin, Tennessee would become one of those unique battles of the Civil War: men on both sides, in a seemingly medieval practice, gathered across an open plain, clearly visible was the full scope of their foe before the attack. When Theodrick “Tod” Carter was born March 24th 1840 to a middle class farming family, his parents could not foresee what was in store for their little boy or what epic event would drastically and forever alter their close-knit family. As a young boy, Carter showed great aptitude for learning and adventure, studying Greek, Latin and philosophy, and then by his mid-teens, conducted business with his father and two brothers. Tod was continually inspired by the example of his older brother, Moscow Carter. Fifteen years his senior, Moscow was already a veteran of the Mexican American war and was working as a telegraph operator for the Illinois and Mississippi Telegraph Company. 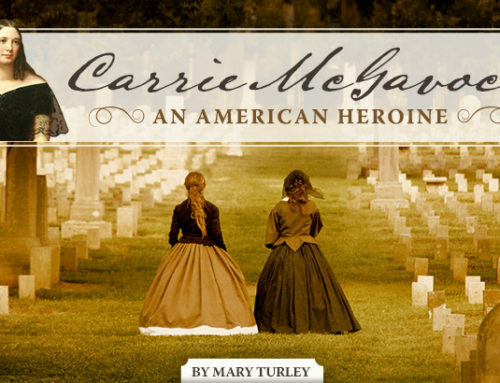 The Carter family was no stranger to tragedy. Tod would never meet four of his siblings that died before he was born and at age twelve, he lost his beloved mother to an influenza that swept through the town of Franklin. Eventually, Tod became an attorney and settled in his profession as an attorney. With his quick wit, contagious enthusiasm and early success as a lawyer, Tod became popular and well-known in his community. Unfortunately, his brief stint in the field of law was cut short as war clouds loomed. Locking up his treasured two paneled law desk that evening in 1861, surely he wondered whether he would ever return to the career in which he had invested so much. Tod, with brothers Francis and Moscow, joined the 20th Tennessee Infantry regiment. Tod was quickly promoted to Captain but found himself painfully alone eight months into the war as his brothers were captured and sent to federal prisons. In addition to his soldiering duties, Captain Carter became a weekly correspondent for the “Daily Rebel,” a newspaper that circulated throughout the South during the war. 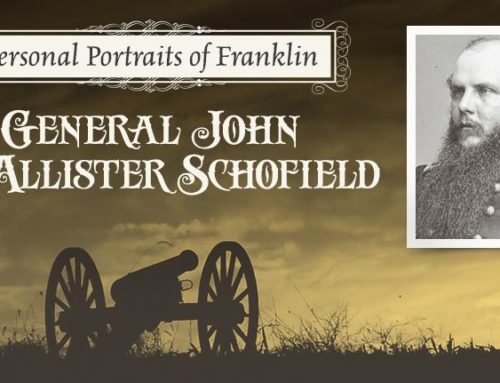 Writing under the pen name “Mint Julep,” he chronicled the events of the war seen through his eyes, and frequently spoke of his love for the Southern cause, inspiring his readers to patriotism and determination in the face of resistance. In November of 1863, Tod was also captured by the Union army near Chattanooga. He was transferred to a federal prison on Johnson’s Island, Ohio. The temperature was twenty-six degrees below zero when Tod joined many of his comrades in captivity, and after spending several months in harsh conditions, Tod pondered his escape. In March of 1864, his opportunity came. He was being transferred by train to a higher security prison in the northeast. While traveling through Pennsylvania, Tod jumped off the moving train into the darkness and found himself a free man, once again. After covering nearly four-hundred miles, without detection by the Union Army, he rejoined his regiment at Dalton, Georgia. The fighting would increase throughout the hot months of summer during the Atlanta campaign, where Tod would once again distinguished himself as a soldier and an aide-de-camp to General Thomas Benton Smith. 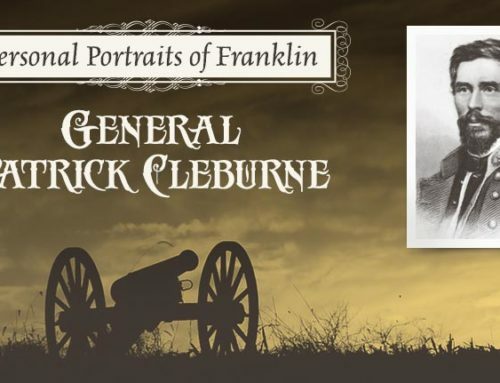 The war eventually brought him back home to little Franklin, Tennessee. There Tod stood with his weary regiment across that open ground that led directly to his family home. On that day, Carter was not merely another man “fighting for his home” in some sort of figurative way but he was literally fighting for all he had ever known home to be. Tod knew that the only way he would see his family again, was to fight through the Union trenches that lay in his path. To learn of Tod’s fate and other personal stories of courage and patriotism in Middle Tennessee, join us March 18-19 for our Civil War in the West Tour: Nashville/Franklin.